A 38 North exclusive with contributions by Nick Hansen and Jack Liu. While it is too early to determine the exact purpose of this new activity, three possibilities are: 1) construction of another tunnel at the West Portal that will take several years to complete; 2) completion or repair of a tunnel at the West Portal area; and 3) the clearing of debris from existing tunnels probably caused by past nuclear tests. The dangers of radioactivity from past detonations are probably minimal in the first two cases, but opening a sealed tunnel previously used for a nuclear test would be hazardous. 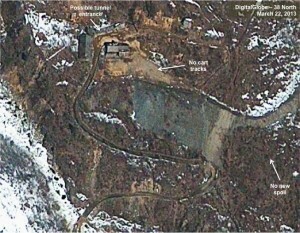 These activities do not appear to be part of preparations for a nuclear test in the near-term. Rather, they seem to be long-term projects—a conclusion reinforced by the presence of installed cart rails—that may be necessary for the conduct of future tests. New satellite imagery from June 1, 2013 has identified a large new spoil and tailings dump site seen along the road between the West Portal area and the old dump site that went into the canyon to the east. The presence of a new dumpsite indicates that tunneling is taking place at the West Portal area for the first time since before the May 2009 nuclear test conducted at this location. Moreover, the light gray color of the new spoil/tailings indicates that it is rock from inside the mountain and not the surrounding brown dirt. The new dumping activity seems to have begun sometime after late March 2013. (Imagery from late March shows no such activity. See figure 1.) 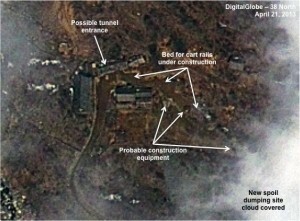 A month later, work appeared to be starting with several pieces of equipment seen in the enclosed yard in front of the tunnel entrances and buildings. This activity was probably the laying of rail tracks for mining carts to carry the spoil from the excavation area to the dumpsite. The new dumping area was not visible due to cloud cover (figure 2). Figure 1. No tunnelling activity at the West Portal in March 2013. Figure 2. By April, preliminary work for new tunneling activity has begun. Imagery from May 13 gives a more complete picture. The new spoil dumping area is visible with gray tailing that appears to be gravel along the cart rail tracks about 125 meters from the site. (A mining cart is visible on the track.) Since the dumpsite is on a steep hill, the tailings slide at least 25 meters down the hill. The tracks appear to enter the head works for the existing tunnels on its eastern side. 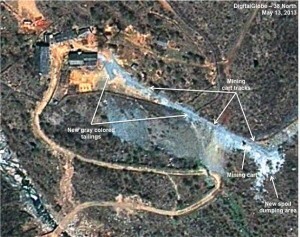 There is a large amount of spoil/tailings that has been taken out of a tunnel in about a month (figure 3). Figure 3. Tunneling activity well underway. The most recent imagery from June 1 shows tunneling activity continuing with spoil apparently coming from the same tunnel entrance seen in the previous photo of the site. The spoil/tailings pile at the dumpsite also seems to be increasing in size (figure 4). Figure 4. Most recent tunneling activity. While it is too early to determine the exact purpose of this new tunneling activity, three possibilities are: 1) construction of another tunnel at the West Portal area that will take several years to complete; 2) completion of construction or repair of an already dug third tunnel at the West Portal area; and 3) the clearing of debris from existing tunnels probably caused by past nuclear tests. While the dangers of radioactivity from past detonations are probably minimal in the first two cases, opening a sealed tunnel previously used for a nuclear test would be hazardous. 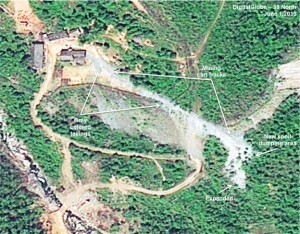 These activities do not indicate that the North will conduct another nuclear test in the near-term. Rather they appear to be long-term projects—a conclusion reinforced by the presence of installed cart rails—that may be necessary for the conduct of future tests.